There’s no better way to get to know a city than taking a tour…or three! 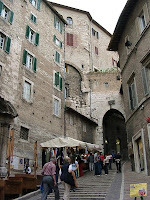 The Umbra Institute offers three different tours to its home city, Perugia. The first is during Orientation, and is a practical walking tour, focusing on pharmacies, the post office, and ATMs. The second, led by Prof. Paola Chiarulla, is a historical tour which gives students a sound background in Perugian and central Italian history. The third tour, though, is pure entertainment. Led by staff member Zach Nowak, the “Perugia Nooks & Crannies Tour” is purely entertainment, though there is some real Perugia history mixed in. Students followed Nowak through back alleys to spectacular panoramas yesterday, and heard about Why Perugia Bread Tastes Terrible (a result of the Salt War), the Aqueduct That Brought No Water, and Alexander Dumas And The Carabinieri. A reprise of the tour will be held later in the semester.